Animag Publishing was established in 2003. The company main product is a monthly magazine with manga and animation related content. Japanese manga and animation have become more popular in Thai society for a long period of time since 1970s. Nowadays manga and animation business in Thailand are rapidly growing with high number of competitors. 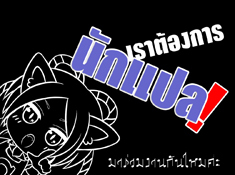 “Animag” is a monthly manga and animation Magazine legally registered under Thai law since 2003. The core concept of the magazine is “not just a translation of Japanese’s Magazine but is filled with its own points of view“. Our goal is to fulfill the gap between animation related companies and consumers in Thailand. The magazine provides news from both Japan and Thailand together with reviews and previews of upcoming manga and animation. The content sometimes including interview people, who related to the animation industry, analyze and criticize specific animation or comic under the academic matter or even in-depth analysis in certain topics or titles. Animag first volume was published in October 2003. It has gained good responses and reputation from both consumers and manga and animation related companies. Animag magazine has been continuously publishing for 5 years with our current 46th volume. Animag Publishing had always taken part in annual national events called “Bangkok International Book Fair”. It’s a two weeks exhibition involving Thai and international publishers and writers, so-called Thai biggest book fair of the year. The total number of participants is approximately two million people. Animag Publishing has been qualified by the Publishers and Booksellers Association of Thailand (PUBAT) in order to take part in that exhibition. In 2008 Animag is moving toward a new project focusing on niche market in the industry by publishing a fan book of a specific title in data-gathering style. The first title is called “Once in a blue moon”. A fan book dedicated to Type-Moon’s famous work “Tsukihime” which include our in-depth analysis and gathered data done from the research upon the title. The books gained high popularity and was almost sold out upon limitation publish. Animag is also operating a web-based E-commerce “animagshop” which is legally registered with ministry of Commerce Thailand. It provides the distribution service of company goods. Animagshop had also joined in various book fairs and other events stated above.